When it comes to America and guns, there is one group that simply dominates in terms of spending: The NRA. And that is hardly surprising since the National Rifle Association has been involved in politics for decades. The NRA has spent more than $11 million helping elect US Senators Richard Burr and Thom Tillis. "As far as a senatorial delegation is concerned they're number one," says Sarah Bryner, research director at the Center for Responsive Politics, the national group which compiled this data. The Center has records from the Federal Election Commission dating back to 1989. Bryner and her team sorted through all those numbers and put them into buckets. The first bucket has to do with campaigns themselves that, Bryner says, "donate money directly to politicians." Burr was first elected to Congress in 1994. The NRA has donated roughly $44,000 to various federal campaigns of his. Tillis, elected to the US Senate in 2014, has received $9,900. But direct contributions to campaigns have become a quaint concept. The real way these outside groups help influence elections is by running independent political ads. And here are the other two data buckets: Positive and negative issue ads that helped either Burr or Tillis. The NRA spent more than $1.9 million running pro-Tillis ads like the one above during his 2014 race against then-Senator Kay Hagan. It also spent more than $2.2 million on ads attacking Kay Hagan. The NRA has spent $1.3 million on pro-Richard Burr ads dating back to the mid-1990s. But during that tenure, the NRA has also shelled out more than $5.5 million on ads attacking Burr's political opponents. Like this spot targeting Deborah Ross, his last Democratic challenger. In fact, the NRA has spent so much on Richard Burr that only one current US senator tops him. That would be John McCain thanks in large part to his presidential run in 2008, when he was the Republican nominee. And though Thom Tillis has only been a US senator for a couple of years now, he ranks fourth on the individual list. Senator Burr and Senator Tillis's respective #2 and #4 rankings on the NRA spending list doesn’t surprise Sarah Bryner "because the races that they ran in are among the most expensive senate races in US history." And Senators run statewide, so politically purple North Carolina means contested races. Bryner says Tillis and Burr are "also running in a Southern State where the NRA has deep ties." Both Senators Burr and Tillis have an A rating from the NRA. This picture is different when it comes to North Carolina's US Representatives. There, the NRA's donations are measured in the tens of thousands, not millions of dollars in part due to the fact representatives run in relatively safe political districts. Now the NRA represents just one side in the gun debate. What about political spending by gun control groups? Yes, the Center for Responsive Politics tracked that, too. Bryner says that can be measured with a lot of zeros, but not in a row. "I don’t think there's any money from that side of things to the North Carolina delegations." Yes, gun control groups are spending millions of dollars on this debate, but as Bryner points out, they're relatively new to the game. "There's been changes in how much money they're able to spend on federal elections more recently with the entree of Michael Bloomberg into this process." And they haven’t shown a willingness to spend huge sums of money in places like North Carolina, where it's easy to find pro-gun Democrats. Now, we've just spent a decent amount of time talking about money in politics. But when it comes to the gun debate and the NRA we may be missing the point, Bryner says. "Money is important, but the NRA's power isn't one of contributions, it's one of a vast membership. And even if they weren’t to contribute a dime to a politician, particularly in the South, those politicians are well aware of the NRA's power in getting their members out to vote." Finally, WFAE did reach out to both Senator Burr and Senator Tillis for comment. We will update this story if they respond. Just hours after Donald Trump’s controversial gun comments in Wilmington on Tuesday, the National Rifle Association announced they were spending $3 million on ads attacking Hillary Clinton in battleground states including North Carolina. North Carolina Senator Richard Burr is one of several Senate Republicans to question the timing of President Trump's decision to fire FBI Director James Comey. It seems October surprises aren’t just for presidential candidates. Monday night, an audio recording came to light showing North Carolina Senator Richard Burr making comments that can be characterized as controversial at best. North Carolina Senator Thom Tillis is applauding the Trump administration's decision to end the Deferred Action for Childhood Arrivals Program, or DACA. Tillis said Tuesday morning it should be up to Congress to set a long-term policy on the status of immigrants who arrived as children. Audio of WFAE's David Boraks interviewing U.S. Sen. Thom Tillis. U.S. Sen. Thom Tillis is used to fielding a lot of questions. It goes with the job. But many questions in the last two weeks have concerned his health since he passed out during a road race in Washington, D.C.
"I ran the fastest 2.5 mile race of my life. Unfortunately, it was a 3-mile race," he quips. As you can tell, Tillis says he’s fine. He says he just didn’t hydrate properly. Of course, Tillis still gets asked about President Trump, Russia, health care, and immigration - all topics he addressed with WFAE’s David Boraks. 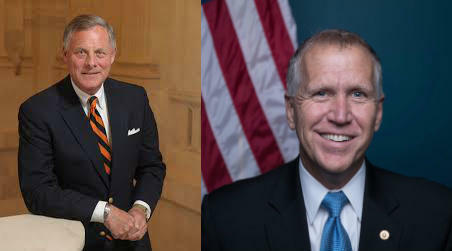 The two major-party U.S. Senate candidates in North Carolina are traveling the state this weekend trying to energize their allies with speeches and visits from out-of-state politicians. The campaigns of Republican Thom Tillis and incumbent Democratic Senator Kay Hagan also are raising a ton of money. With help from wealthy donors and outside groups, more than $100 million now has been spent on the North Carolina Senate race, the Charlotte Observer reports. On Thursday, the North Carolina House is scheduled to take a final vote on a bill which would all but end the need for concealed-carry permits for handguns. Yesterday, the House gave its tentative approval for the measure but by a slim margin. The bill is controversial and even before debate began yesterday groups both for and against the proposal took to unusual tactics to get their message across.